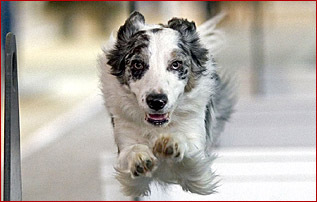 Gizmo is a 4-year-old mix who runs on Dog>Gone Flyball in Sarasota, Florida. She is a rescue dog owned and loved by Stacy & Galen Groff. At adoption, she was so shy that no one was able to touch her. Through flyball and basic training, she has turned into a wonderful dog. Flyball has made her confident, social, and excited about the world around her. Gizmo took a long time to train for racing � she was scared of the flyball box and "tournament noises" like whistles and barking � but is now running reliably with Dog>Gone's Developmental team. She has earned her FD & FDX titles and despite being afraid of the box initially, now has a photo-perfect box turn! At 60 pounds, Gizmo gets 4 paws on the box every time. Indiana is a 7 year-old miniature australian shepherd from Sidekick Kennels in St. Stephen, New Brunswick. Owned and handled by Rachel Hope, Indy has been the A team height dog for almost her entire flyball career with the Fast'n FURious Flyball club of Charlottetown, Prince Edward Island. 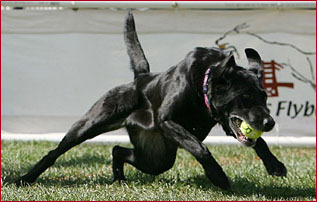 Indy was the height dog in Region 10's current speed record breaking runs for both the regular and multi divisions. She was awarded MVP for Region 10 in 2005 and was awarded "Top Flyball Dog" by the Prince Edward Island Veterinary Medical Association that same year. Indy has a remarkable ambidextrous swimmer's turn which came from the need to always keep her competition in sight. 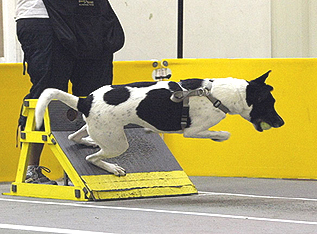 Indy, an anchor dog, will often be seen checking the other lane at the finish line. She loves a close race. At the age of three, Indy was diagnosed with epilepsy. 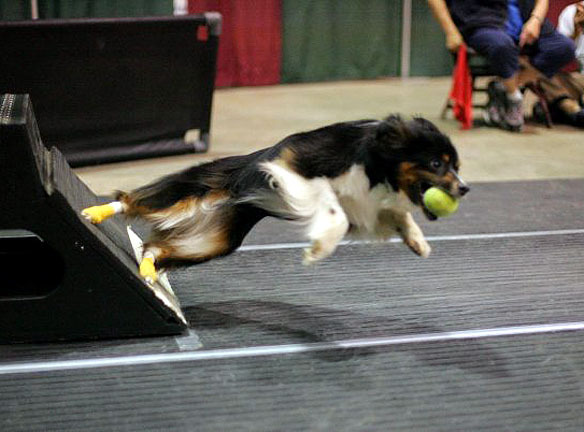 With proper treatment and care, she has been able to continue her flyball career despite her condition. She is a great example that dogs with epilepsy can not only lead a normal life, but participate in fast paced dog sports as well. 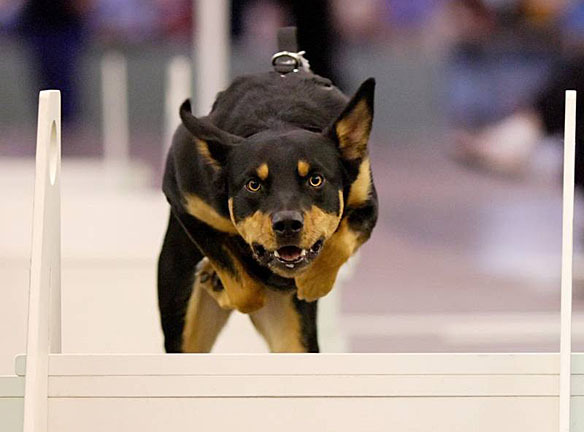 Kane is a four-year-old Australian Kelpie who has been competing for two years and loving every minute of it. He runs on the Long Island Road Rage team, which also is just two years old. In June 2007 he was selected to be one of the Dream Team members at the Coconut Classic tournament in Pennsylvania. He was again chosen for another Dream Team at the New England Trailblazers' tournament in May 2008. Kane was trained by Long Island Road Rage and his best time to date is a 3.9. He is owned and loved by Louise Wetzel. 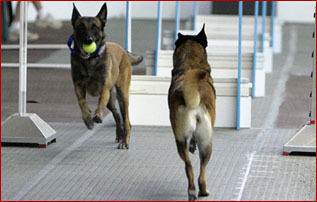 Running towards the camera is Dogma's Loki (Loki), a Belgian Malinois who competes on Waverunners in Florida (Region 11). Loki was rescued from the Broward County Animal Control Shelter in 2002. His first tournament was in 2002, where he earned 1 point. Since then he has earned his FDGCh30, every point of which was on the same team. He is now 7 years old and in the last year he and his handler have gotten three .000 starts. His best time is 4.5 over 11" jumps. Loki is owned and loved by Sally Saxton. Most who have raced in or against Region 2 teams will have seen the bouncing Whippet who since 1996 started for Ball der Dashers. 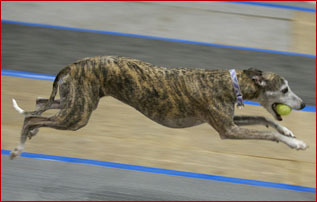 Lyric, owned & loved by Carol-Anne DeVenne, was one of the first Whippets racing in Flyball. Up until then, few people believed that a Sighthound could be trained to retrieve or be trusted off leash to participate in this sport, but Lyric's competitiveness & enthusiasm certainly changed that. Lyric hated to be beaten, so would turn on the afterburners in order to beat the other dog over the start line. Two Whippets starting & the teams prepared themselves for a race with many starts! This year Lyric retired at the age of 12. During her career she has earned 50,500 NAFA points, is #3 Whippet on the Breed list & #171 on the Top Pointed Dogs of all breeds. 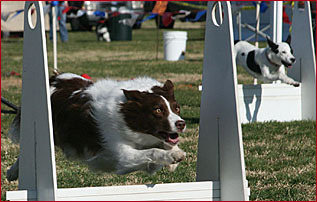 She holds many titles in Agility & Lure Coursing, and competed 4 years in the Big Air Dog Dock Diving competition. Who would have thought that a Whippet would jump into water? She was a Sighthound pioneer of sorts & one just has to look at the racing lanes today to see Lyric's lasting influence on the sport! Stitch (Solo�s U Had Me N Stitches) is a soon-to-be four-year-old blue merle Border Collie who runs on Flat Out Flyers in Texas (Region 5) as a start dog or anywhere else in the line-up. Stitch has his FDCh-G title, and his best time to date is a 4.9. He�s excelling in flyball as well as agility in several organizations. Owned and loved by Kim Davis, Stitch is his mom�s cuddle bunny and lives with his two �brothers� and one �sister� (all of which compete in dog sports). Stitch�s parents are Wildfire�s Charm My Way (Charm) of Canine Conspiracy in Region 5 and Red-Dawn Aiden out of Dallas, Texas. This wonderful shot, taken by Mark Fletcher, really shows the fun he�s having.